Ever wanted to see a graph of how much email you’ve received from particular person, or about a particular topic, over time? 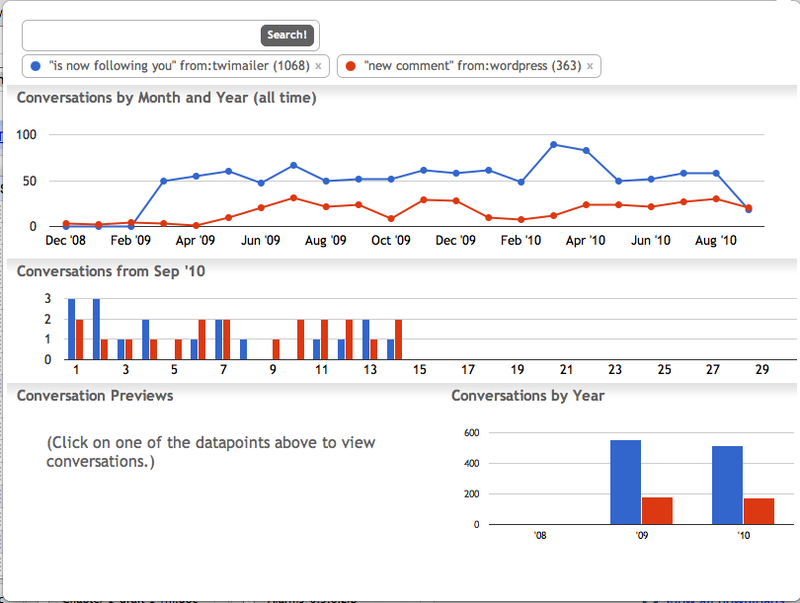 Graph Your Inbox is a Chrome (s goog) extension that plots the results of Gmail search queries. It’s a bit like having Google Analytics for your inbox, showing the number of conversations that match a particular result for all time (month and year), by the days of the current month, and per year. 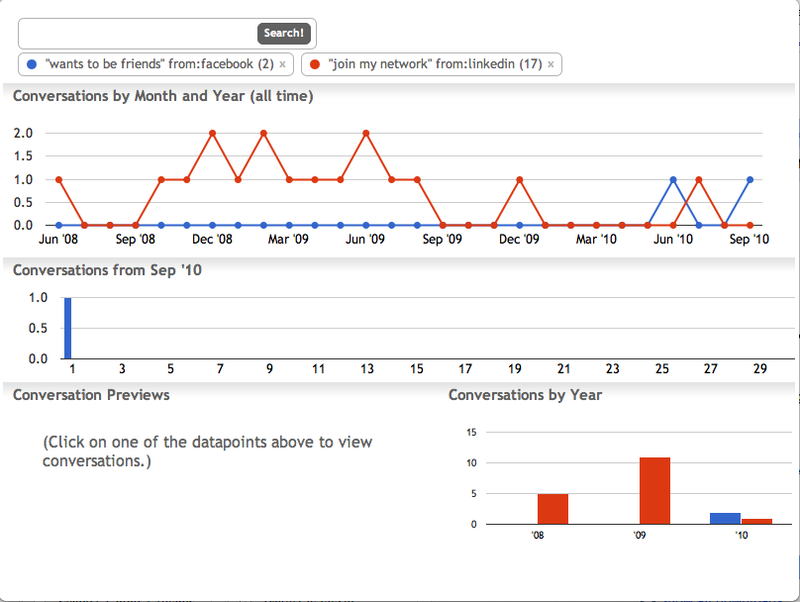 While it’s fun using it to plot things like the emails your Mom has sent you, as I played with Graph Your Inbox, it became apparent it could actually be quite a useful tool; you can use it to discover insights you may not previously have had. It’s especially useful being able to plot the results of more than one query on your chart, so you can see, for example, Twitter “follows” versus notifications of comments on your blog to see if there’s a correlation. You can plot the results of any Gmail search query, so you can use powerful operators like label:, has: attachment, from: and to: in your searches. If your results reveal a particular datapoint that’s interesting (a huge spike in your chart, for example), you can click on it to bring up a preview of all of those conversations to dig a little deeper. There is a vast amount of valuable information that’s stored in our inboxes. Not only hard data, like the information that’s present in the emails themselves, but statistical information, such as the frequency of communication with a particular person, which can indicate how important a contact they are. Unsurprisingly, there are several startups developing tools for extracting that information from the inbox and doing something useful with it: Liaise, Rapportive, Gist and Xobni, for example. Graph Your Inbox is much more limited than those tools: It only makes fairly simple charts; it’s only available as a Chrome extension; it will only work on emails you have stored in your Gmail inbox; and it won’t work on all Google Apps for Domains accounts. Despite its limitations, however, the ability to throw queries at your inbox to see what correlations there are is surprisingly useful; Graph Your Inbox is a neat proof-of-concept that shows that there could be a market for more complex and powerful analytical tools for email. You can install Graph Your Inbox here. It doesn’t retain your data or send information to any server. 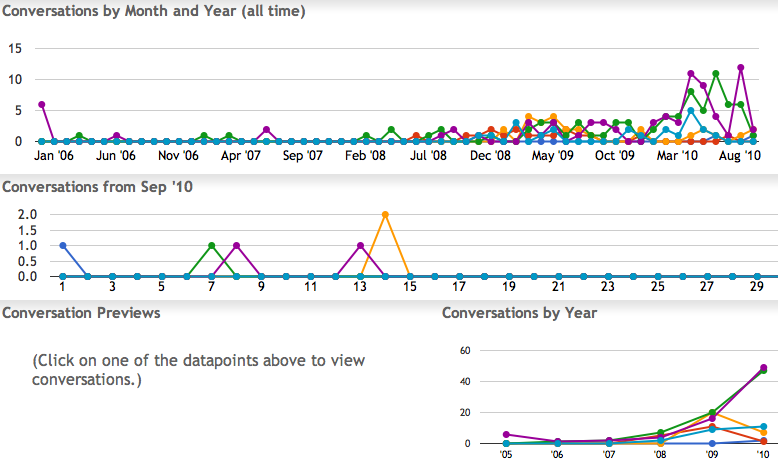 What interesting results have you found using Graph Your Inbox? I tried this out and found some interesting results. I graphed the phrase “meet for coffee” and see a huge spike when I became self-employed. I charted iTunes versus Amazon receipts (you can see the definite bump of the app store). But the best one was graphing Netflix “we’ve received” messages. I could actually visualize my usage rates in a way that I’d never had before. (Netflix isn’t particularly interested I guess in showing me how often I actually use their service, which isn’t surprising). Twitter â€œfollowsâ€ versus comments on your blog – posted twice? Anyway, this is a great idea. Never heard of similar tools mentioned in this article, but will try to graph my inbox…right now! You really liked Â«Twitter â€œfollowsâ€ versus comments on your blog.Â», didn’t you? You put the same example twice.